Today my sweet sister came and took Vera out to a play group at the botanical gardens with Tuula. Then they’re going to this "sonic lunch" event downtown where local bands come and play for free. Vera was so excited to dance with her cousin. I packed her a little lunch and sent her off, and she was so excited. It’s made this morning really easy and quiet- life feels so good right now. I had a friend come over, Jeff’s been working on the greenhouse, I cleaned some, took pictures and relaxed in the sun with Asa (who’s still a teeny bit yellow, so he’s soaking up the rays). Now I’m able to sit down and snack and write a little… so nice! It’s definitely a bit more of a juggling act with two, but it’s a way easier adjustment in so many ways. I was thinking about it, and while I have to learn to manage my time and do my best to fill the needs of two little people now, it’s a much different transition for me this time. First of all, I’m no longer dealing with the transition from just Jeff and I to "mother". I dealt with some strange feelings surrounding being one of the only one of my friends with a kid, etc. I’ve worked through that stuff, though, and now I’m just thinking about things like how cool it is to have our little family now and to be able to settle into it. I sit and wonder about what our family dynamic will be like- how Asa and Vera will get along… me, being the mother of a girl and a boy, and Jeff being the father to these two… I mean, of course, but it’s profound to me at this stage. I also have far less body issues- I feel very mature about that aspect this time around, which is incredibly refreshing. I doubt I’ll shed a tear over this changed body of mine. I have a great respect for it and I feel really healthy (although a little sore today. kind of like I might have pushed a tiny human through my pelvis recently… go figure). Right now I’m just thrilled by how quickly I’m recovering. I feel almost back to normal, although I’m taking it slowly because I know you can do too much too soon. The last of the trellises went up a couple of days ago- the ones with chicken wire for the melons and cucumbers. Really late, but we were able to train the unruly vines pretty easily. They look pretty cool to me. One of our little lilac bushes is randomly blooming again. So pretty. Mrs. Peacock. The most adventurous and dominant and noisy of the ladies. She’s awesome. We changed the other one’s names a while ago, and I forgot to mention it. The other brown one there is Miss Scarlett, then in the back (the darker of the barred rocks) is Yvonne, then on the right is Mrs. White. Garden at the end of July. Such a jungle! I’ve got to start thinking about what to plant for fall soon. I can’t believe we’re almost in August. Time just is flying this year. I was thinking about it, and I think our garden makes our yard look bigger than it is. People are always commenting about how much space we have, and while I don’t disagree, we have exactly as much space as most of our neighbors. The entire lot with the house and front yard is .19 acres. It’s a really average lot size around here. And we’ve really only utilized the sunny half of our back yard with garden. I wonder if just seeing how productive that amount of space can be makes it seem big… I don’t know. Either way, I’m so thrilled with how amazing our beginning efforts are turning out to be. We already have 22 quarts of green beans in storage. Yay! And a big project, which will take years to complete, I’m sure. Our totally shaded front yard. I’m getting some plants for it this fall, and then I’ll do more in the spring, but I’d like to totally eliminate the lawn. We’ll see. I’ll learn a lot, I’m sure. I think it’s so funny how basically right where our yard ends is this distinct line of shade… I’m definitely going to be researching the forest floor over the next several months. My midwife lent me this awesome shade gardening book, which is loaded with inspiration. 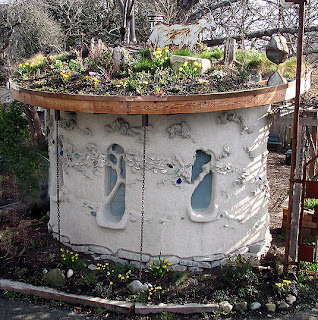 My ideas are pretty rough right now, but I’d love to make it really full of plant life, but also incorporate some kind of a cob playhouse for the kids. I thought about doing it in the backyard, but the front yard is just so unused… If we do that, we’ll probably put up a little picket fence. Anyway, I’d love an opportunity to practice working with cob, and I saw this and fell totally in love. I think it could be really cool. that’ll be a nice size greenhouse, you’ll be able to do so much with it! early greens in the spring, etc. I know, aren’t baby toes delicious? I am really hoping to be able to do enough to possibly distribute greens to family or something… we’ll see! Have you ever dealt with a greenhouse? And I love the roof and windows on that little cob shed. Those were the details that I’d really love to preserve in our version… so great. I don’t know if you got my email or not… is tomorrow still good? I am dying over Asa’s pouty lip! And the cobhouse? Cutest. Playhouse. Ever. Thank you! Yes isn’t it? I’m gonna do the garden top and everything- imitation is the sincerest form of flattery, right? You guys should totally do a cob playhouse for Henry! I love your posts and I know how you feel about juggling a new little one and how it can change the dynamic. It’s really hard to find time now with my third baby and we’re starting our home school year in just a couple weeks! I wonder if the laundry will ever be done? I wonder if I’ll ever feel like I’ve got it all under control instead of running from one to the other trying to settle things out with them? Gosh it’s such a blessing to be a busy Mommy! I love having things to do and projects to work on but I am not sure where it all fits right now!